According to Dobyns carpal instability is “a carpal injury in which loss of normal alignment of the carpus occurs early or late”. It is symptomatic due to carpal malalignment under physiologic loads. Scapholunate dissociation (SLD) is the most common carpal instability. It occurs due to injury to scapholunate interosseous ligament (SLIL). SLIL may either be injured alone or in combination with other ligaments such as radioscaphocapitate ligament or dorsal intercarpal ligament. 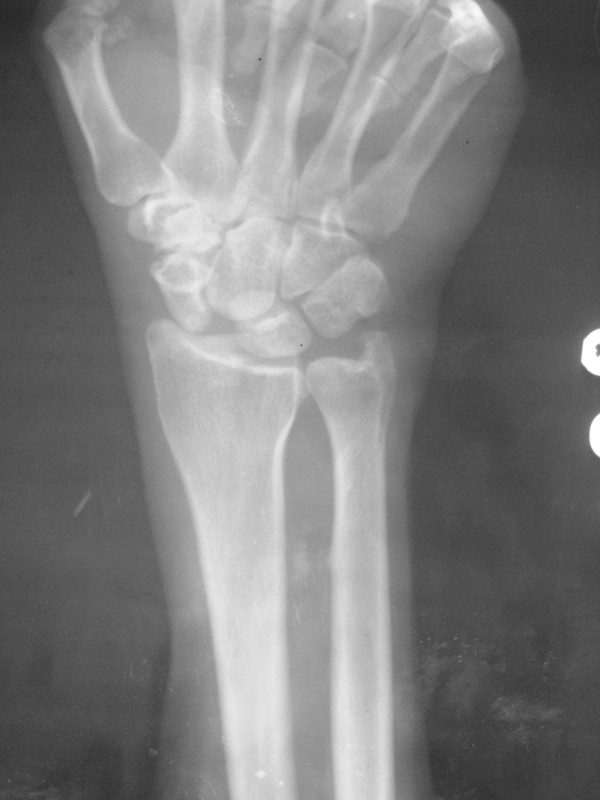 SLD may occur alone or in combination with other injuries such as radial styloid fracture (Chauffeurs fracture) or as a part of perilunate instability. Anatomically the proximal surface of carpus appears similar to a condyle. But it is not a true condyle, but a composite condyle made of scaphoid, lunate and triquetrum attached to each other by interosseous ligaments. No tendons insert into the carpus but 3 sets each of tendons cross the carpus on the dorsal and volar aspect; influencing carpal motion. These three sets of tendons are finger extensors and flexors centrally, wrist extensors and flexors on the radial and ulnar side. The specific intercarpal motions occur due to the presence of ligaments which selectively restrain or allow individual carpal motion. Ligaments of the wrist may be classified into intrinsic, deep extrinsic and superficial extrinsic ligaments. Intrinsic carpal ligaments are those between carpal bones of the same row. Scapholunate ligament is U shaped and is thicker dorsally. Its rupture leads to increased flexion of scaphoid, extension of lunate, increase in the scapholunate gap and dorsal translation of proximal pole of scaphoid. In addition to SLIL, the scapholunate interspace is stabilised by others ligaments. These secondary stabilisers can be dorsal or volar. Volar secondary stabilisers are the radioscaphocapitate ligament and the scaphotrapezial ligament. The dorsal secondary stabilisers are the dorsal radiocarpal or dorsal intercarpal ligaments. Injury to secondary stabilisers will worsen the instability, which is likely in perilunate dislocations. Wrist has one of the most complex kinematics in the human body. Various concepts like row theory by Johnston in 1907, column theory by Navarro in 1921, modified column theory by Taleisnik in 1978 and oval ring theory by Lichtman in 1981 have been used to explain carpal motion. Flexion occurs mainly in the scaphotrapeziotrapezoid, radiolunate and ulnotriquetral articulations. Extension occurs mainly in the radioscaphoid, lunocapitate and triquetrohamate articulations. Thus the axis of flexion which passes through STT, radiolunate and ulnotriquetral joints and the axis of extension which pass through the radioscaphoid, lunocapitate and triquetrohamate joints; cross at the scapholunate interosseous ligament. Hence SLIL is subjected to high stresses and is highly prone for injury. It is the most common instability pattern because the intercarpal lines of flexion and extension movement cross at the scapholunate interface. Another reason is that compression forces transmitted through the capitate has a tendency to separate the scaphoid and lunate. During radial and ulnar deviation; both the carpal rows move in the same direction in the frontal plane. During radial deviation; the proximal row flexes, and the distal row extends in the coronal plane. During ulnar deviation, there is extension of the proximal row and flexion of the distal row. Such reciprocal movements help to keep the hand in the neutral position. Kinematically the wrist is considered to be similar to a 3-link system. The three links are the radius, lunate-triquetrum and the distal row-metacarpal complex. As it doesn’t have any tendons directly inserted to it; the proximal row acts as an intercalated segment between the radius-TFCC complex and the distal carpal row in a three joint link system. Intercalated segments collapse under compressive load. Collapse of the proximal row under compressive load is prevented by the presence of scaphoid which acts as a crosslink between the proximal and distal rows like a slider crank. Under compressive loads, the natural tendency of scaphoid is to palmar flex and the natural tendency of triquetrum is to extend due to their shape and their ligamentous attachments. Compression of radial column during radial deviation flexes the scaphoid which in turn leads to flexion of the proximal row. Compression of ulnar column during ulnar deviation leads to extension of triquetrum which in turn leads to extension of proximal row. In the normal wrist the tendency of triquetrum to extend the proximal row is counterbalanced by the scaphoid. The dorsal horn of lunate is thinner than the palmar horn; hence under compressive forces transmitted by the capitate the lunate has a tendency to extend. In scapholunate dissociation, the triquetrum extends the lunate as the counterbalancing by scaphoid is absent and the scaphoid is flexed. This leads to dorsiflexion of lunate, palmar flexion of scaphoid which will increase the scapholunate angle and lunocapitate angle creating the dorsal intercalated segment instability (DISI) pattern. Usually it occurs due to a fall on the outstretched hand (FOOSH) leading to forced dorsiflexion and ulnar deviation of the wrist. Patients present with pain and swelling of the wrist. There may be tenderness over the dorsum of wrist just distal to the Lister’s tubercle. There will be painful restriction of wrist movements. Watson test may be positive. This test is done by placing the thumb of the examiner over the scaphoid tuberosity and applying pressure in the dorsal direction. With the other hand; hold the hand and move the wrist repeatedly into radial and ulnar deviation. A painful clunk is suggestive of SLD. Investigations needed for evaluation are x-ray, arthrography, video fluoroscopy, MRI and arthroscopy. X-rays needed are the PA in neutral position, radial deviation and ulnar deviation, lateral view, lateral oblique view and medial oblique view and clenched fist AP view. Gilula Lines are 3 arcs to be looked for on the PA view. First arc is on the proximal surface of proximal carpal row, second arc on the distal surface of proximal row and third on the proximal surface of capitate and hamate. Any asymmetry or gap suggests carpal malalignment. Normally lunate appear rectangular on the PA view; if it is triangular it is malpositioned. Normally scaphoid lies in an oblique plane on the AP view and the proximal and distal thirds can be seen to be separated by the waist. In patients with SLD, the scaphoid is flexed leading to shortened appearance on the PA view, there may be the cortical ring sign on the PA view due end on view of distal pole. Normal gap between scaphoid and lunate is 9 mm at 7 years of age and 3 mm after 15 years of age; a gap more than 5 mm (Terry Thomas sign) is diagnostic of SLD in presence of ring sign. It should be compared with the opposite side before confirming the diagnosis. If there is a strong clinical suspicion but the x-rays are normal; then a stress x-ray with the patient clenching the fist will show increased gap. The scapholunate angle should be measured on the lateral view. Draw a line connecting the centre of the convex surfaces of the proximal and distal poles of scaphoid. Draw a line connecting the dorsal and volar lips of the distal articular surface of lunate and draw a line perpendicular to it to get the lunate axis line. Normal angle is 30-600. An angle greater than 800 confirms SLD. Draw the axis line for lunate and capitate on the lateral view and the angle between the lines gives the lunocapitate angle. Normal is 0-150. If the lunate is dorsiflexed as in DISI, the angle is >150. I-Attenuation or hemorrhage into SLIL on midcarpal arthroscopy. Bones congruent. II-Scapholunate incongruency on midcarpal arthroscopy. IV- Gap allows passage of 2.7mm arthroscope. Depends on the duration of injury, severity, reducibility, associated injuries and whether the injury is static or dynamic. Injuries without incongruence (partial injuries) are treated by immobilization. Injury with partial SLIL disruption with a gap that is reducible by closed manipulation or percutaneous K wire joysticks is treated by reduction and percutaneous scapholunate and scaphocapitate K wires and immobilization. 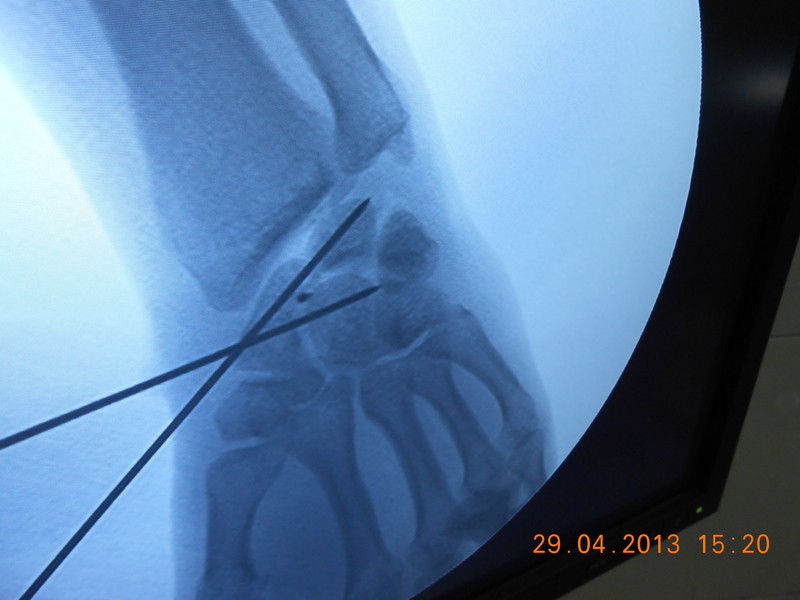 Gap > 3 mm, scapholunate angle > 600, lunocapitate angle >150 are indications for open reduction and ligament repair. If the gap is more than 5 mm; SLIL repair and repair or advancement of palmar ligaments is usually necessary. Dorsal incision centered over the Lister’s tubercle. Retract extensor pollicis longus radially and extensor digitorum communis medially. Open the capsule by a radially based flap preserving dorsal intercarpal and dorsal radiotriquetral ligaments. Put a K wire as joystick into the lunate in the proximal-dorsal to distal-volar direction to allow flexion of lunate during reduction. Put a K wire into scaphoid as joystick from dorsal-distal to volar proximal direction to allow extension of scaphoid during manipulation. Visualize the SLIL tear which is usually avulsed from scaphoid. Freshen the site of reattachment. Manipulate the joysticks to reduce by flexing the lunate and extending and supinating the scaphoid. Reattach the ligament using intraosseous suture anchors such as G2 Mini anchors 1.9 mm (Depuy Mitek) and nonabsorbable sutures. Tendon strips from radial extensors can also be used for augmentation if the quality of tissue available for repair is poor. Almquist and Linscheid technique utilizes extensor carpi radialis brevis (ECRB) and the Brunelli technique uses extensor carpi radialis longus (ECRL). Close the wound in layers and immobilize for 3 months. Subacute SLD needs ligament repair and augmentation by dorsal capsular flap. In addition palmar approach for repair and advancement of radioscaphocapitate and radiolunate ligaments to overcorrect the scaphoid flexion should also be done. In chronic SLD without arthritis; ligament repair and augmentation is the preferred treatment if the gap is reducible. If not reducible or if there is arthritis (Scapholunate advanced collapse – SLAC)then limited carpal fusion such as STT fusion is preferred. In presence of advanced arthritis; wrist arthrodesis is preferred. in subacute, less than 4 weeks but greater than 24 weeks does not make sense, it falls too in the acute (less tan 4 weeks) and chronic (more than 6 months – which is roughly more than 24 weeks).. right?